Ensemble Offspring just spent an epic weekend as part of Baiame’s Ngunnhu Festival in Brewarrina, run by Moogahlin Performing Arts. 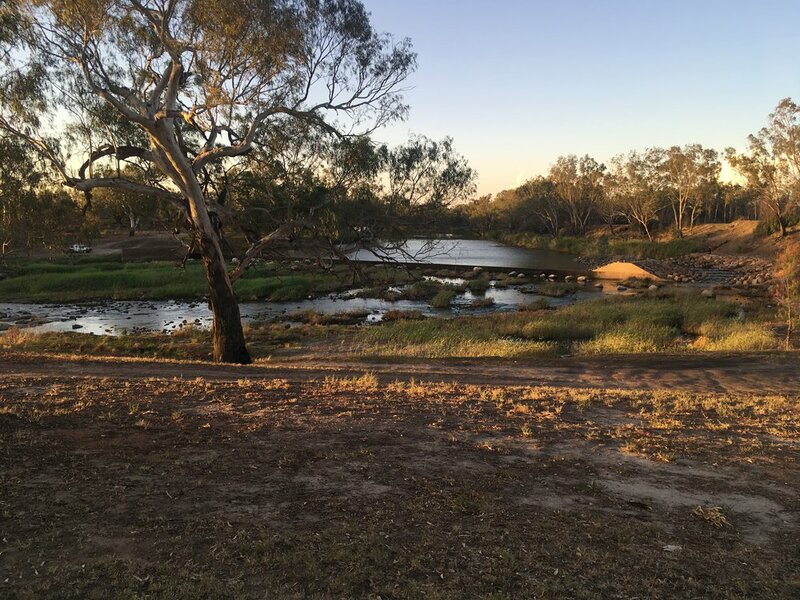 Around 774km northwest of Sydney, the town of Brewarrina sits right on a curve in the Barwon River, and the locals consider the fish traps (Ngunnhu) to be the oldest manmade structure in the world. According to legend, the ancestral figure Baiame cast a net across the river, creating the Ngunnhu, and the site has long been a meeting place for Indigenous peoples ever since. So what was Ensemble Offspring doing at the Festival? We were there to perform works as part of the inaugural Indigenous Composers Initiative. This project involves Ensemble Offspring performing the works of five indigenous composers: Brenda Gifford, Rhyan Clapham, Elizabeth Sheppard, Troy Russell and Tim Gray. The works are incredibly varied, but all seem to reflect on a sense of place and belonging. It was especially fitting sitting back and hearing the rest of the group performing Troy Russell’s River Life, the group positioned metres away from the Barwon River, as dusk approached, with the sounds of galahs and children playing in the background. We had performed this gig last year at Eora College in Redfern, but the music seemed more potent and meaningful at this festival. Perhaps it was the inquisitive nature of all the kids, who came up and sat right next to us as we warmed up and did a sound check. A couple even offered to be my page turner, as the wind was so gusty. Speaking of which, I certainly took in a mouthful or two of dirt, but managed to keep the flies at bay. Perhaps the music itself had a strong sense of connection to the land, and playing outside made this connection more visceral. Before we performed, I managed to have a good look in the museum, where artwork reflected a lot on the life of the local people. Particularly moving were the videos on the stolen generation, with harrowing accounts of families torn apart. The local kids performed before us, singing and rapping to messages of what life is like in Brewarrina, with lots of smiles, dancing and even some gymnastic moves thrown in. They were ably led by the inspirational Ryhan Clapham, recent recipient of the Peter Sculthorpe Music Fellowship. And to top the day off, a Chinese dinner at the local RSL, which took me right back to Chinese restaurants of my childhood. Managed to fit in a game of pool and a couple of hours sleep at the Brewarrina Pub, before having to make a treacherous drive alone at 4:30am to Dubbo Airport, narrowly evading hundreds of roos along the highway. While I won’t be making that pre-dawn drive again anytime soon, I certainly look forward to revisiting both this festival and the township of Brewarrina.